I’ll admit that I haven’t done as much cooking in London as I’ve done at other points in our life. I feel like I’m just missing too much kitchen equipment (no blender, no mixer, no crockpot, etc). We have eaten a lot of pancakes and jam for dinner in the last three months. It’s probably been the best three months of Ella’s life. But it does mean that when I make a meal, I’m extra proud of myself. And this one was a super winner. 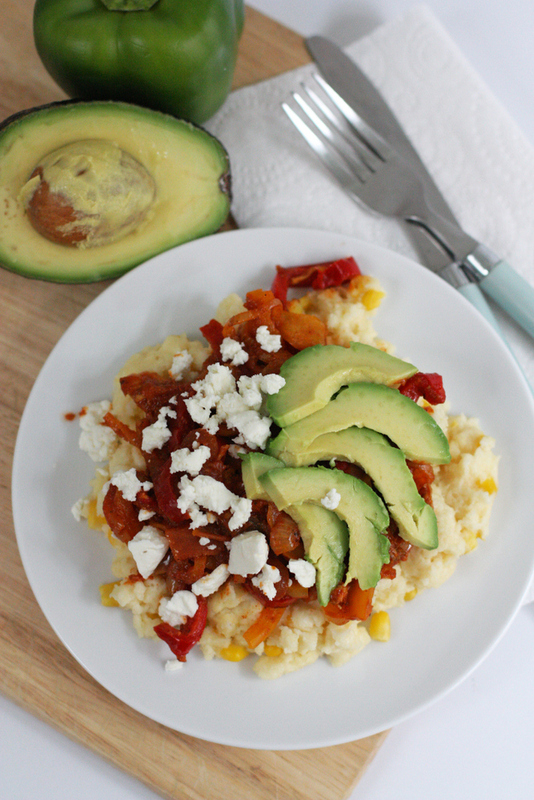 I love polenta because it’s so easy, it’s a nice change from rice or pasta, and my girls totally love it. Also, cornmeal costs approximately nothing. In a large skillet, heat olive oil over medium-high heat. Add sliced peppers and onions and cook, stirring frequently, until softened and slightly browned on the edges. Remove from pan and set aside. Place your chicken breast(s) in the skillet, sprinkle with salt, pepper, chili powder, paprika, cinnamon and nutmeg, and let cook until browned on all sides. Add the salsa and and bring to a simmer, letting the chicken cook all the way through. Shred the chicken with two forks, add the cooked peppers and onions back in and stir to combine. Salt and pepper to taste. 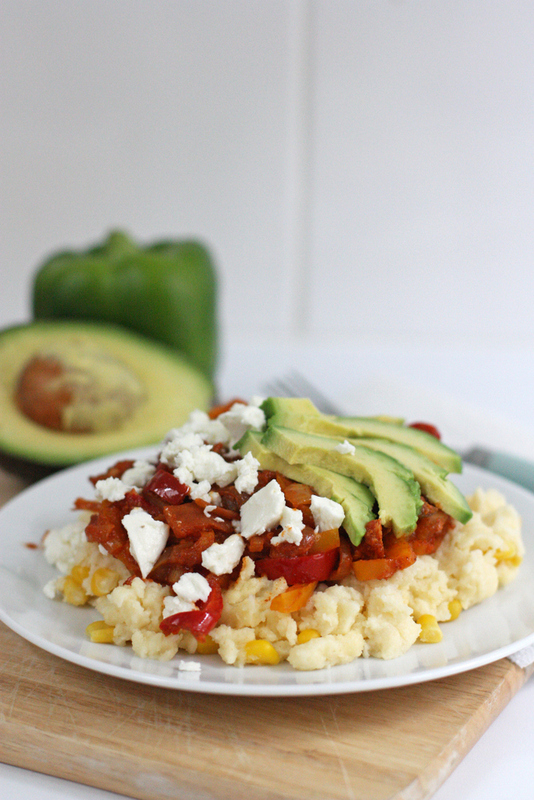 While the vegetables and chicken are cooking, make the polenta in a large saucepan. Warm the chicken broth and milk over medium heat and then whisk in the cornmeal slowly (don't wait until it starts to simmer because I find it really hard to keep the polenta from getting lumpy when the liquid is that hot). Let it cook for a few minutes until it thickens. If you have lumps, use an immersion blender to smooth it out. 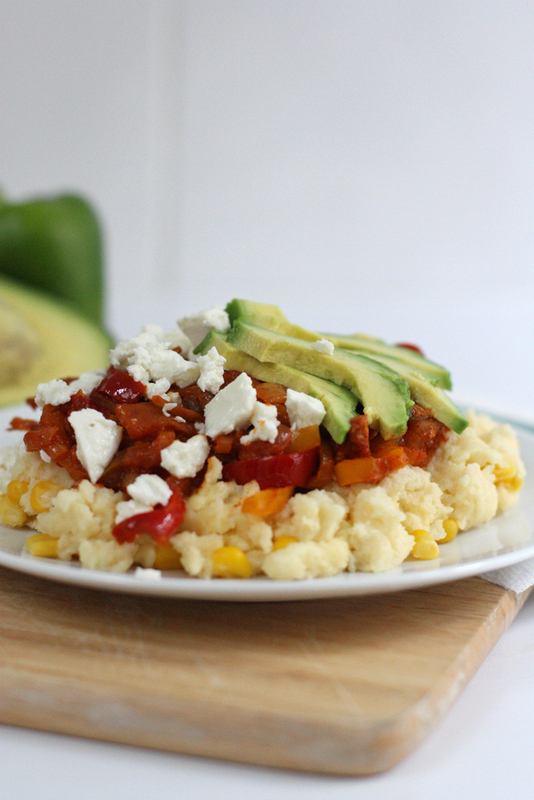 Add the corn kernels and cheese, stir to combine, and let cook until the cheese is melted. Stir in the butter and then add salt and pepper to taste. 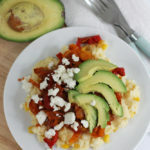 To serve, put a scoop of polenta in a bowl, layer on a big spoonful of the chicken mixture, and top with avocado/guacamole and some crumbled feta. Wow. This is our tomorrow night's supper for real. Thanks! ^ ditto Mimsie. This looks delicious! Made this tonight, sans salsa because my husband can't have any tomatoes (I know, very sad) but oh how we both loved this. THANK YOU so so so much!! Love all your recommendations!